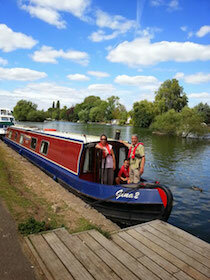 The MRC-Gina class canal boats. Narrowboat Gina is a luxury canal boat with a modern and fresh feel, whilst still retaining the quaint charm of an English canal boat. 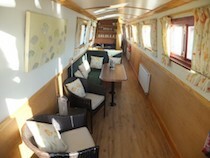 There is seating on the front deck and the stern deck has ample room for 4 - 5 people. The central heating via radiators and stove keeps you warm and cosy in the cooler months. Wifi on board. A sim card can be purchased at booking for Â£20.00 giving 2gb of data. This can be taken home with you afterwards. 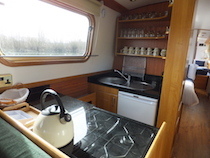 The galley has a granite work surface, a full size 4 ring gas hob, grill and oven. There is also an under counter fridge with a freezer box compartment. Cooking utensils and crockery are all provided. The bathroom offers a flush toilet, wash basin and shower. 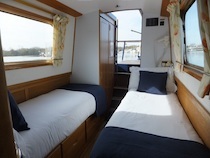 There are also 240v plug sockets throughout the boat (Please note: if you decide to use any of your own electrical appliances, you do so at your own risk). A welcome pack is provided, consisting of washing-up liquid (x1); dishcloth (x1); floor cloth (x1); toilet roll and bin liner.